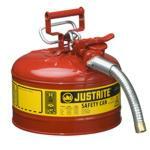 Justrite® Type II safety cans. 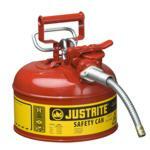 FM (Factory Mutual) Approved non-explosion Type II safety cans with flame arresters allow you to control flammable liquids easily. These Type II safety cans have separate fill and dispensing points.